After a week of waking with goopy eyes, occasional sneezing and my voice sounding a little off, it's time to stop calling this a kitty cold even though my cat had the same symptoms first. With the eyes itching at times and symptoms improving and worsening depending on an east wind it's time to watch the red tide. Respiratory irritation is occurring in Brevard. Dead fish are present in Brevard, Indian River and St Lucie Counties. The most recent testing has been around the Tampa area which still has areas with higher levels of red tide. On the east coast Melbourne/Satellite Beach area is the farthest north it is at the moment with moderate to high levels detected. Had a first hand report that Cocoa Beach was beautiful and red tide free today. Long Point and around Sebastian Inlet, including in the river has higher levels as does north of Port St Lucie. Bryan Bobbitt updated through Keep Brevard Beautiful, "I want to take a moment to thank the many volunteers that came out to help the KBB staff today in Melbourne Beach. Together we defined community and filled a few dumpsters but still have a long way to go. We may be shifting farther south tomorrow and still need your help. Please call the KBB office at 321-631-0501 to see where we will be if you can come help." Photos by Bryan Bobbit. Adding the daily update as a picture below from newest to oldest. Red Tide is getting worse in Panama City, East and West Central Florida. Daily Sample Results for the last eight days From Florida Fish and Wildlife Conservation Commission. Current Red Tide Conditions for East Florida from NOAA. This graphic is released generally twice a week during red tide blooms. Hurricane Michael is making his way to Gulf Coast. Below is a self updating blog. Refresh the page to see the newest info as Satellites and the National Hurricane Center updates. Leslie is now feeling the southerly flow of the west side of a subtropical ridge drawing it north at 10 mph. It should turn more easterly soon. Min pressure is 984mb. Max sustained winds are 65mph. Still watching the Caribbean. Models are pretty inconsistent about what may happen. Blob looks disorganized tonight, though it has a lower level circulation the convection is sheared and it's embedded in a trough. Shear may let up some over the weekend. 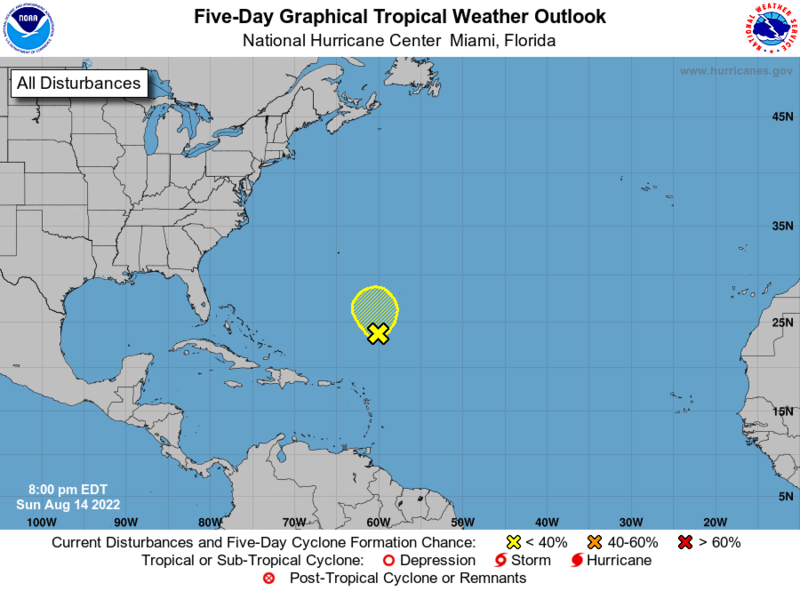 NHC upped the 2 day odds of it forming to less than 20% and it's 5 day to over 40%. Some beautiful footage of 8+ swell at RC's. Music by Sigur Ros. All shots in 4K on the Mavic Pro. Goes-East at 10/03/2018 03:00z showing Leslie and a new blob of interest. Sort of a Kirk reprise. Models have been wanting this to develop for days. They have also pushed this storm's development back and movement around. Looks kind of gamely and shear maybe dropping. 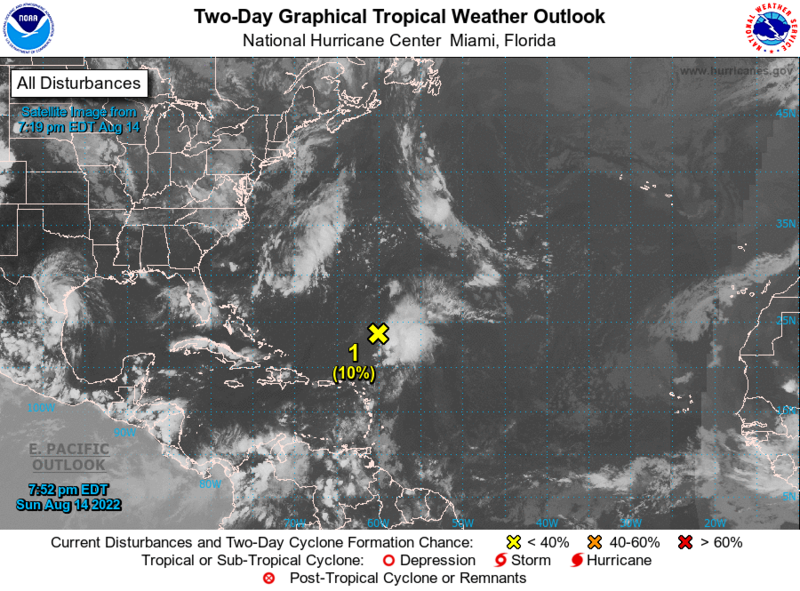 Refresh page to see the fresh Atlantic 5-dayTropical Disturbance Graphical.